We know how hard it is to get kids to eat their vegetables. Sometimes we don’t want to eat them ourselves! That’s why this twist on a classic recipe is perfect for finicky eaters. 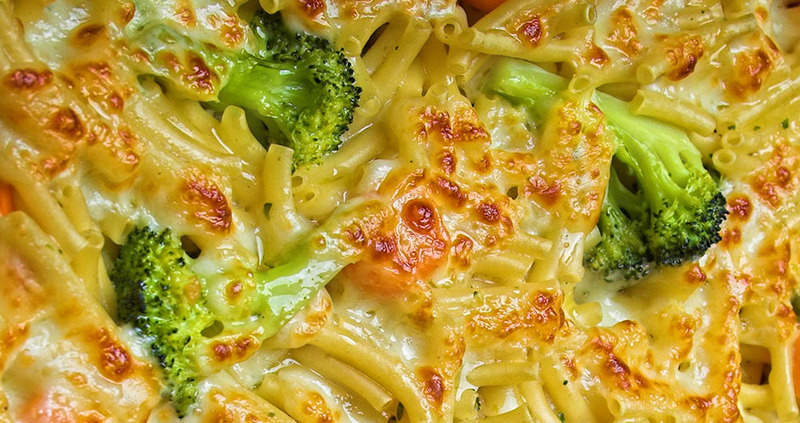 After all, who doesn’t love macaroni and cheese? This kid-friendly dish has the added bonus of healthy carrots and broccoli to provide needed vitamins without sacrificing that taste we know and love. It’s filled with cheesy goodness so no one even notices the vegetables hiding inside. This easy recipe can also be customized with other vegetables, such as cauliflower, so don’t be afraid to experiment! Preheat oven to 350 F. Heat water in a pot until boiling, then add macaroni, cooking it according to package directions. Bring another pot of water to boil. Add carrots and broccoli, and cook for one to two minutes, until tender. Heat butter in a Dutch oven over medium-high heat. Add onions and garlic, and sauté until soft. Add milk, broth and flour to the Dutch oven, and whisk until the sauce is thickened, about five minutes. Add cheeses, Dijon mustard, salt and pepper, and mix until cheeses have completely melted. Add broccoli and carrots to cheese mixture, and stir together. Mix in macaroni. Pour macaroni mixture into 13 x 9-inch baking dish, and sprinkle with breadcrumbs and paprika. Bake macaroni and cheese for about 15 to 20 minutes, or until cooked through.